Belgian veteran Philippe Gilbert won the Paris Roubaix cobbled classic on Sunday after a cat-and-mouse final struggle with Germany's Nils Politt. Gilbert's compatriot and teammate Yves Lampaert was third. Six riders, including defending champion Peter Sagan, broke away with around 55km remaining but the Deceuninck-Quick-Step pair Gilbert and Lampaert worked together to drop the Slovak on the final cobbled section. The victory gives former world champion Gilbert his fourth of five of the "Monuments," the Tour of Flanders, the Tour of Lombardy and Liege-Bastogne-Liege, just Milan-San Remo is missing from his prize list. Gilbert called his bid for all five Monuments "Strive for Five," after winning Flanders solo in front of adoring home crowds in 2017. Politt and Gilbert came into the iconic Roubaix velodrome 30 seconds clear of Belgian champion Lampaert. The crowd cheered wildly as the duo eyed each other on the final lap. Gilbert pulled ahead with 50 metres to go before crossing the line in emotional scenes. "It's really special. It was a really daring attack and it came off," said the 36-year-old who also led an earlier breakaway and was the architect of Sagan's downfall. Gilbert said he was proud of reinventing his style to carve out a successful late career. "When I decided to go for the classics they said the cobbles weren't for me. I was just a puncher, but now I'm more complete. "It was a crazy gamble to join Quick-Step but that's the beauty of sport," said the affable all-rounder who has won stages on all three Grand Tours. Gilbert spoke glowingly of the runner up and revealed the pair had a history of working together. "We both deserved to win," Gilbert told reporters after gleefully riding his bike all the way to a desk in the press centre. "We were a great duo and we worked so well together, giving it everything." Politt, just 25, who has been threatening this kind of result in the classics this season said he had learned a great deal from his German compatriot Andre Greipel. "My only chance today was to get him in the sprint," said the Katusha-Alpecin rider, who spoke without a trace of disappointment. "Nobody ever dares to test Sagan. If you don't test your rivals then you'll never break them," Gilbert said of how he saw off the 2018 champion. The champion laughed when asked about his chances of winning Milan-San Remo or tackling the Olympic Games in Tokyo next year. "I'll be watching that on the telly," he joked. The race is known as 'the Hell of the North' due to its 29 body-battering cobbled sections, some 54km of the 257km race, which are even given star ratings of one-to-five for their difficulty and danger. 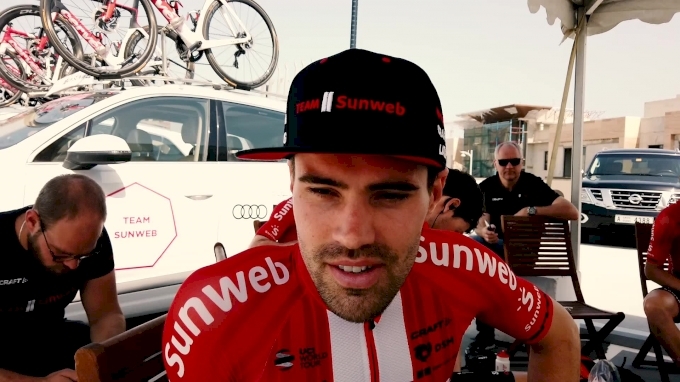 The race was marked by relatively few crashes, although Tiesj Benoot went to hospital after crashing through the back windscreen of the Jumbo-Visma team car that had braked suddenly to miss a faller. The 25 teams of seven riders were mercilessly exposed to the elements in the open fields as many Flanders flags, brandished by roadside fans, flapped and whipped in biting winds. British outfit Team Sky, who are changing sponsors, had been hoping for a farewell win and set a fierce early pace but when Italy's Gianni Moscon fell and then team leader for the day Luke Rowe got a puncture, any chance of an unlikely send off celebration were undone. Highly fancied Norwegian Alexander Kristoff punctured twice and was dropped half-way through. Another tipped rider, the talented Belgian cyclo-cross champion Wout van Aert made it into the final elite selection despite two punctures and a fall. But as with Sagan, and Education First rider Sep Vanmarcke, the sustained effort saw him suddenly pale and drop off with around 20km remaining. Get the best cycling news straight to your inbox. 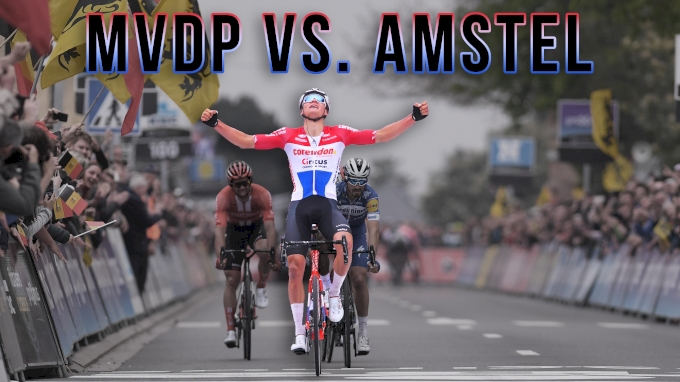 The Amstel Gold, the only Dutch classic on the cycling calendar, has not had a domestic winner this century, but this year home fans are becoming excited about Mathieu van der Poel. Spoilers. We hate them just as much as you. For users who’ve had the outcome of an event ruined by a title or image on FloBikes, we hear and feel your pain. The Amstel Gold Race covers 266 kilometers and 35 short but steep climbs in the Limburg region of the Netherlands. Here's how to watch the 55th edition of this iconic event. In his short tenure at Team Sky, the young Colombian has taken home victories at Paris Nice, the Amgen Tour of California, and Colombia's Oro y Paz. Many cyclists would happily hang a career on Bernal's accrual of WorldTour podium placings in just his first year as a pro. Aaron Davison, 22, who struck and killed 19-year-old cyclist Tommy Ketterhagen, has been sentenced to 10 years in state prison for violating the terms of his probation. Belgian cyclist Victor Campenaerts set a new one-hour world record for distance covered on a track on Tuesday with 55.089km, edging past the previous record set by British great Bradley Wiggins. Trek-Segafredo's Colombian Jarlinson Pantano has failed an out of competition doping test for the blood booster EPO, the International Cycling Union (UCI) said on Monday. The 2020 Giro d'Italia will begin in Budapest with another two stages also being held in Hungary, organisers announced on Monday. Spain's Ion Izagirre won the Tour of the Basque Country on Saturday as a fourth-place finish in the final stage was enough to secure a dramatic victory in Eibar.